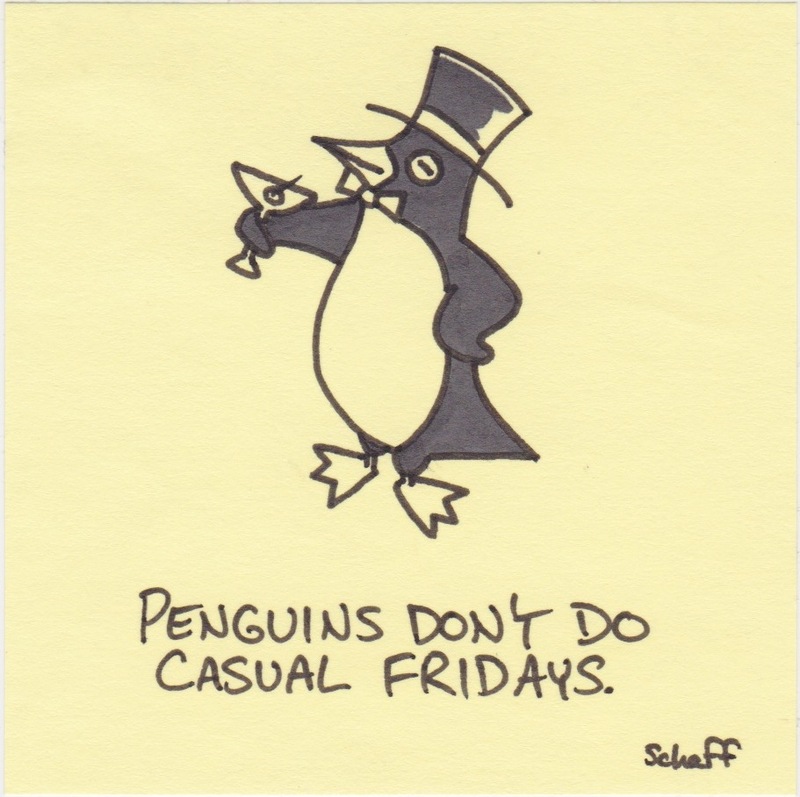 Penguins don’t do casual Fridays. Two nights ago while brushing our teeth, I was asking our daughter Emma what sounds different animals make. We started with the easy pet types (cats, dogs, and birds) before moving on to barnyard livestock (cows, roosters, pigs, horses). Like every other two-year-old in the world, she was a pro at mimicking each of these creatures. It wasn’t until we came to some of the more exotic members of the wild kingdom that things started to get interesting. Me: What does an elephant sound like? Emma: Yeah. Their big noses… achoooooooo! Me: Okay. How about a Penguin? Emma: /high-pitched, squeaky voice/ Penguin, penguin, penguin. Me: That’s what they say? Emma: Baby penguins. Mama penguins say – PENGUIN, PENGUIN, PENGUIN! Me: Wow. Well, what noise do monkeys make? Emma: I like pink bananas! She delivered each of these answers with no hesitation and complete confidence. At the moment, we’re not sure if she’s a little bit brilliant or just completely batty. Either way, she’s awfully entertaining. 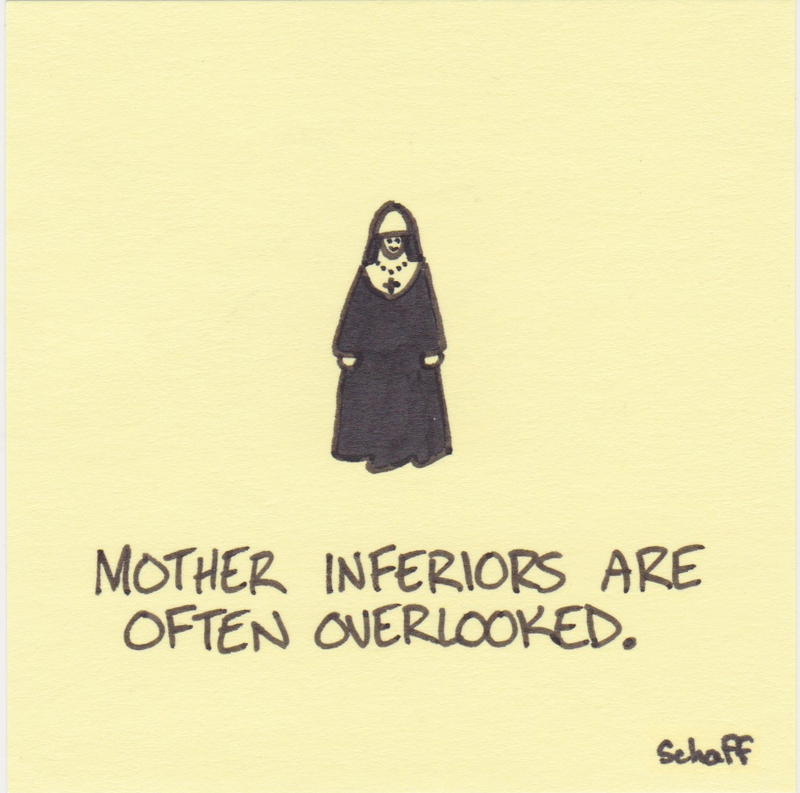 Mother inferiors are often overlooked. When I was quite young our family moved from Kansas to Alaska. One of the most immediate differences that our family noticed was the way that people dressed for church on Sundays. In Kansas, men wore suits (or at least a shirt and tie) and women generally wore dresses. At the age of four, I already owned a goodwill suit and clip-on tie. It was the norm. In Alaska, things were very different. Men and women both wore sweaters, turtlenecks, t-shirts, jeans (gasp! ), and even jackets emblazoned with the name of local bars. Although we adapted to the more relaxed style over time, to a strict Catholic family from the midwest it looked less like Sunday Mass and more like laundry day. 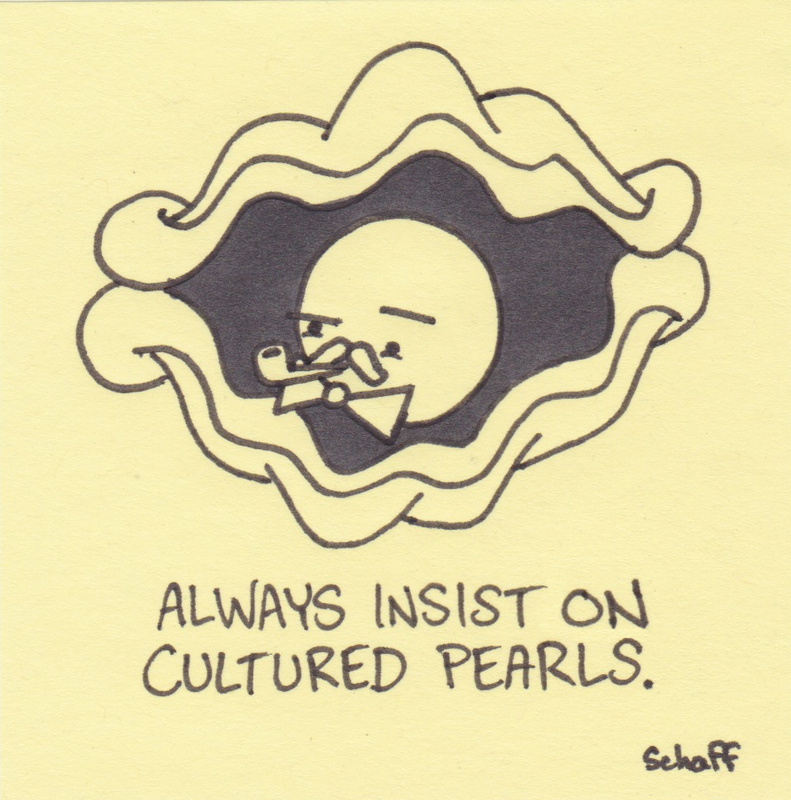 Always insist on cultured pearls. You are currently browsing the Inkjot blog archives for February, 2013.